In a press conference at the Davao International Airport early Saturday morning, President Duterte revealed that he shed teras upon learning that her daughter, Davao City Mayor Inday Sara Duterte lost two of her triplets. "Maski noong una pa yan it took her a long time to be pregnant and you, know, with the medical intervention. Well somebody called me, I went to the bathroom and...nasa labas kami, nasa lobby kami. 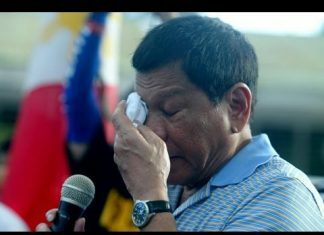 I cried, I cried," Duterte said. Earlier, Davao City Mayor Sara Duterte-Carpio announced that she lost two of the triplets that came only a few weeks after she announced her pregnancy. President Duterte also announced that he doesn't hate the media despite of what he thinks they did to him. Do not feel afraid to attack or criticize me because it is your sworn duty to ask questions. Your right to inform is embedded in the constitution. You are recording the history of this country. With the accurate and true representation of what's going on, saludo ako sa inyo. Weeks after assuming the Presidency, Duterte signed an Executive Order (EO) that would form a task force whose mandate is to solve the media killings in the country.